Since I started the sideshow circuit we call “horror writers,” I’ve been continually amazed and pleased. Never have I met a more friendly, smart, and generous band of contemporaries. Yes, the very people who write about serial killers, weird phenomenon, B-movie monsters, and everything in between have been so good to me, they make all other genre writers look scary! Anthony is one of those authors, and I’m grateful today for his invitation to guest blog, on this Wizard Takes a Mini-Blog Tour stop! Can we talk about that dirty “g-word” for a second? Yes, “genre.” I can’t lie: I never wanted to be saddled with a genre label. What follows is my observation about what other writers think of the genres they don’t write. This is not an ordained list of facts, by any means, and I do not share these opinions. Feel free to chime in with your own perceptions if they conflict, okay? 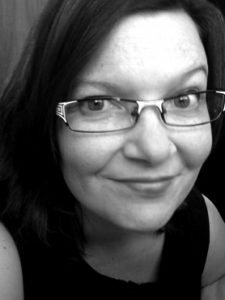 In my experience doing the writing conference circuit, and from conversations with my writerly friends, these are the negative connotations I’ve gleaned about the genres we write. YA fiction writers are JK Rowling wannabes, or penning the next Sweet Valley High. Oh, wait. I got a bit off track there, I think. Where was I? Oh, yeah. Genre. The truth is, genre is a dirty word among novelists for good reason. Even if you manage to dodge the slings and arrows of outrageously unfortunate categorization, do you really want to be told you’re only this kind of writer, or that? What if you’re not a product, but a person? Hrm. We can agree where to shelve books, sometimes—but people don’t need to be shelved alongside them. Authors and their products are two very different things. But I remember well my personal panic and disappointment when I realized my first book was not the prize-winning literary masterpiece I thought I was entitled to write. I was smart, I was capable, and I was decently-connected to literary types. Why shouldn’t I pay my dues pounding out some meaningful bit of prose? Well, I did. And edit after edit, as I cut ream after ream of gratuitous fluffery, I realized my book was shaping up into…horror. Did that make me sick-minded? Maybe, yeah. But I decided I would make my horror novel the best horror novel it could be. This Brilliant Darkness was fantasy/horror/SciFi, really. I settled for the label “dark fantasy” and ran with it. I was the only sick-minded writing freak I knew, and I honestly never expected that to change. I was totally prepared to go that road alone. Then last year, I stumbled onto a fine lot of horror authors in a little place called the Coffin Hop, and that creepy, backwoods road less traveled has made all the difference. I’m not a zombie writer, though many of the Coffin Hoppers are. I only recently discovered how much I could enjoy The Walking Dead on AMC. Since then, I’ve read zombie stories, and you could have knocked me down with a feather, man. With a dead, oozing, contaminated feather. I really liked them. Did I mention I’m not a zombie writer? 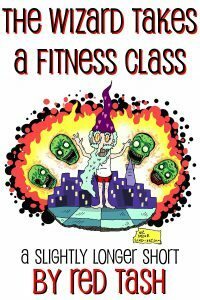 Tell that to the four undead Kung Fu artisans who show up as pets in my short story, “The Wizard Takes a Fitness Class.” Yes, it’s absurdist. Yes, it’s a nod to all my horror-writing friends. Yes…it made me want to write about zombies again. And next time, with feeling. And with more braaaaaaains. The Wizard Takes a Fitness Class is the reader-demanded follow-up to the flash fiction short, The Wizard Takes a Holiday. Get to know the mysterious Wizard and his personal demons, as he exercises among them on the dancefloor. Sometimes the best way to exorcise one’s past is to just sweat it out.